In her home country of Kenya, Dr. Christine Ngaruiya has lost family members and loved ones to diseases and afflictions that, in many cases, were preventable — like complications of diabetes and heart disease. These cases have informed her passions in medicine. Ngaruiya, assistant professor in emergency medicine at Yale School of Medicine, advocates in both her medical practice and her writing for increased access to health care for marginalized populations and for more action on non-communicable diseases, which have eclipsed infectious disease as the leading cause of death around the world. Ngaruiya was born in Nebraska; her parents studied in the Midwest before returning to Kenya because they wanted their children to be familiar with the country and its culture. Ngaruiya attended elementary, middle, and high schools in Kenya and entered the University of Nebraska as a freshman in 2002, at the age of 15. She went on to medical school at the University of Nebraska Medical Center. Ngaruiya’s interest in health disparities began in “Sociology of Health,” an undergraduate course at the University of Nebraska-Lincoln. Sociology professor Julia McQuillan had done research that suggested that minority women made fewer visits to physicians than white women and were less likely to trust their physicians. The data, along with her newly minted knowledge sparked Ngaruiya’s interest, and before long she and her professor were co-authors of a paper on the subject. As a medical student Ngaruiya did more than just study health disparities. She founded a health education and linkage-to-care program targeting refugees in Nebraska, the leading refugee resettlement state per capita in the United States. Bridge to Care, based in Omaha, has helped more than 5,000 refugees from Bhutan, Sudan, Somalia, Burundi, and Eastern Europe to obtain improved access to care. “This very large population around Omaha and Grand Island,” she told Nebraska magazine, “was struggling with the kinds of language and cultural adaptation problems that can make it difficult to find a doctor or a clinic to meet your health care needs.” The details of the program and early outcomes were published in a journal article, and in a book chapter. Ngaruiya also returned to the University of Nebraska Medical Center in 2016 where she gave grand rounds at the School of Public Health on the use of community based participatory research in underserved populations and its role in founding Bridge to Care. After earning her M.D. degree Ngaruiya completed a residency in emergency medicine at the University of North Carolina at Chapel Hill, then a fellowship in Global Health and International Emergency Medicine in the Department of Emergency Medicine at Yale, concurrently matriculating with a master’s degree in tropical medicine and international health, and a diploma in tropical medicine and hygiene at the London School of Hygiene and Tropical Medicine. She joined the Yale faculty as a clinical instructor in 2015, and became an assistant professor in 2016. She continues her work focus on refugees as one of three Yale School of Medicine faculty members on the board of IRIS (Integrated Refugee and Immigrant Services), the lead refugee resettlement agency in the state of Connecticut. She has served on the board for almost three years. Along with her work to end health disparities, Ngaruiya has contributed to efforts targeting non-communicable diseases, which she sees as two sides of the same coin. For the past four years, Ngaruiya has worked on projects with KEMRI-Wellcome Trust, the African Population Health Research Center and the Africa Mental Health Foundation in Nairobi. In 2017, she joined as a senior contributor to the Kenya WHO STEPS study, a national cross-sectional study assessing the burden of lead NCDs and risk factors across the country partnering with the Kenya Ministry of Health, and other key stakeholders in the NCD field in Kenya. Throughout all her various work, Ngaruiya has always been an avid mentor both at Yale and on the continent. She is passionate about helping to building research capacity on the continent where there are many driven and energetic professionals who lack mentorship from an already strained healthcare system. 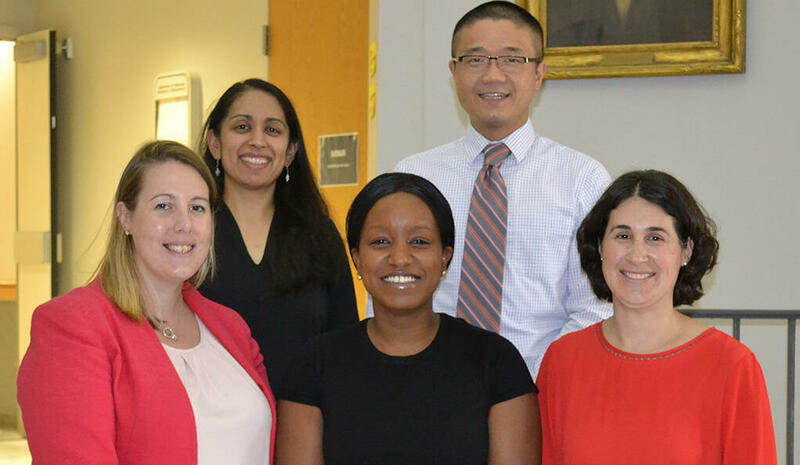 In the past several years Ngaruiya has trained or mentored trainees from the Yale Schools of Medicine, Public Health and Nursing, as well as Quinnipiac University. Over her two-year tenure on the faculty at Yale, she has mentored trainees on more than a dozen papers, abstracts, and presentations. She also sat on the committee for the African Federation for Emergency Medicine trainee research workshop in Addis Ababa in 2014, and in 2016 served as a scientific reviewer for the Cairo symposium where she also mentored several trainees. Ngaruiya is currently spearheading a novel longitudinal intervention to support research capacity building that targets NCDs in East Africa alongside National Institutes of Health partners, academics, and leading research organizations in the region. Her work has brought her numerous accolades: an assistant professor in emergency medicine at the Yale School of Medicine, she has garnered the Emergency Medicine Residents’ Association’s Augustine D’Orta Award for outstanding community and grassroots involvement, the 2014 Harambe Pfizer Fellow Award for social entrepreneurship, and the 2016 University of Nebraska Outstanding International Alumnus award. She was also one of 20 Yale Public Voice Fellows in The Op-Ed Project for 2015-2016 with her writing appearing in such magazines as Time, The Huffington Post, and The Hill, as well as scholarly journals. In her writing, Ngaruiya urges increased awareness of non-communicable diseases, additional resources for health providers, and increased and improved education for patients on how to reduce the risk of debilitating complications. The highest actionable risk factors, she writes, are diet, exercise, and alcohol and tobacco use. These silent killers are taking over, she says, and the time for action is now.